AN ELLA WHEELER WILCOX BIBLIOGRAPHY by Richard A. Edwards, c1997-2000. The complete IMAGE and/or TEXT is available of some of the works listed marked with this image . All in a coach and four. Words by Ella Wheeler Wilcox. [no date] 4 pieces. 33 cm. First line: The quality folk went riding by. The beautiful land of Nod. Boston : The Boston Music Co., 1904. Separate parts for violin, and voice and piano. The beautiful land of Nod : song. New York :; Boosey, 1908. Note(s): For voice and piano./ Cover title./ Words also printed as text preceding score. Responsibility: the words by Ella Wheeler Wilcox ; the music by Liza Lehmann. The birth of the opal : a cantata for women's voices. New York : G. Schirmer, 1890. Musical Score : 1 score (19 p.) ; 27 cm. California : waltz-song : or duet ad libitum. Los Angeles : S. Seiler, 1908. Musical Score (5 p.) ; 35 cm. NOTES: For voice and piano. Caption title. First line of text: I have wander'd into Egypt. Lyrics by Ella Wheeler Wilcox and music by F. R. Burton. Galen Drake, Narrator; with Wayne King and His Orchestra. Tracks include: The Gondolier, Poem: If You But Knew; Hand in Hand, Poem: I Want You (Arthur Gillom); Miss You, Poem: Miss You (David Cory); Midnight Bells, Poem: Midsummer (Sidney King Russell); Tales from the Vienna Woods, Poem: I Love You (Ella Wheeler Wilcox); Walt Night in Heaven, Poem: You and I (Henry Alford); Our Dream Waltz, Poem: You Kissed Me (Josephine S. Hunt); Lullaby for Latins, Poem: Why Do I Love You (Elizabeth Barret Browning). Douze mélodies pour voix et piano. Saint-Nicolas, Québec : Editions Dobermann-Yppan, 1994. Musical Score : 1 score (xi, 52 p.) ; 30 cm. NOTES: French and English words. Biography of composer and critical notes precede score. Philosophie : op. 3 / text by Armand Silvestre -- Ici-bas : op. 11 / text by Sully Prudhomme -- Enfant! Si j'étais roi ... / text by Victor Hugo -- Qui saurait? : op. 14 / text by Armand Silvestre -- Mon bouquet / text by Louis Fréchette -- Mon secret ; Marguerites / text by Gonzalve Desaulniers -- Impromptu ; Orgueil / text by Charles Gill -- When love is lost ; Some day / text by Ella Wheeler Wilcox -- La petite souris grise : vielle chanson / Anon. -- Annexe : Morceau de concours. 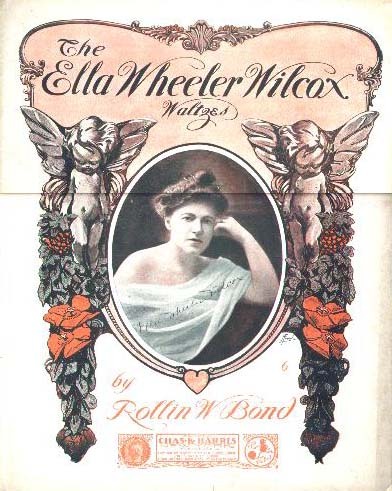 The Ella Wheeler Wilcox Waltzes. 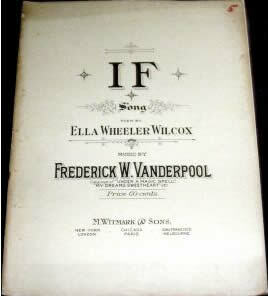 Music for female voice and piano; text by Ella Wheeler Wilcox. Famous songs and those who made them : a collection of five hundred songs, ballads, duets, trios, quartets, and choruses, three hundred illustrations and portraits, original compositions by American writers, and great songs of all ages. New York : Bryan, Taylor & Co., 1895-1897. 3 v. (1640 p.) : ill. ; 31 cm. NOTES: Includes works for solo piano. Includes index. 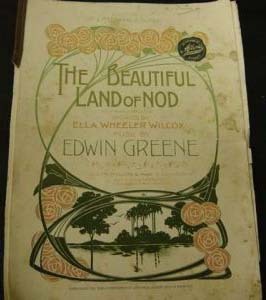 known American Poets and song writers, and include the following: Thomas Bailey Aldrich, James Whitcomb Riley, Margaret E. Sangster, Mary Mapes Dodge, Will Carleton, George Parsons Lathrop, Ella Wheeler Wilcox, John Hay, Richard Henry Stoddard, John Vance Cheney, Frank Dempster SHerman, Julia C.R. Dorr, Katherine Lee Bates, Arlo Bates, and many others." 18 ms. parts ; 32 cm. 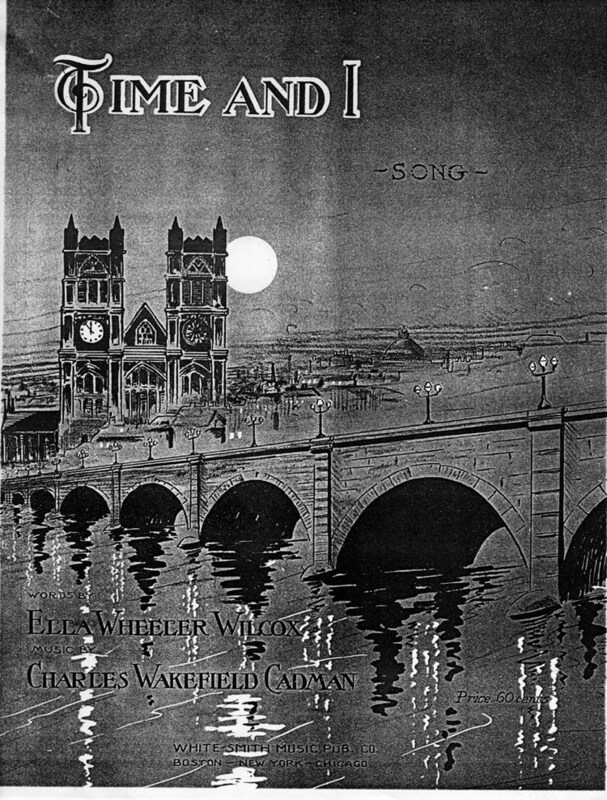 Note(s): Arranged for band, without text./ Caption title./ Accompanied by 1 newspaper clipping, being a letter discussing the poem "Greater Britain" by Ella Wheeler Wilcox./ Also accompanied by: Greater Britain : patriotic war song / words by Ella Wheeler Wilcox ; music by George R. Ceiley. London : Weekes, c1915. 1 vocal score (10 p.) ; 36 cm./ Reproduction: Microfilm./ Urbana, Ill. :/ University Library, University of Illinois at Urbana-Champaign,/ 1998./ Item 16 of 16 on 1 microfilm reel ; 35 mm./ Sousa Preservation Project, Sousa Archives for Band Research, University of Illinois at Urbana-Champaign./ Funding: Microfilming funded in part by the National Endowment for the Humanities. 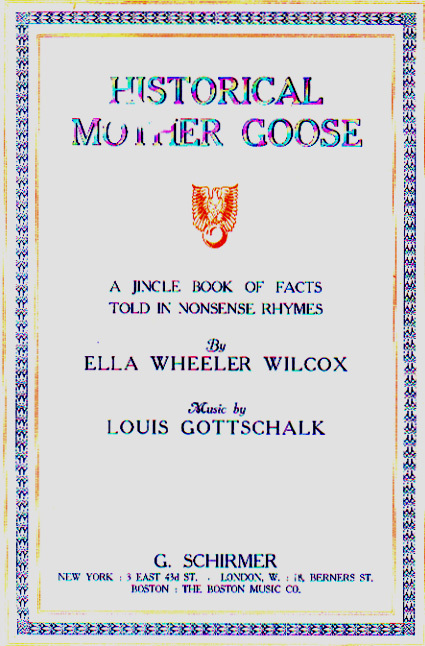 Historical mother goose; a jingle book of facts told in nonsense rhymes. by Ella Wheeler Wilcox. 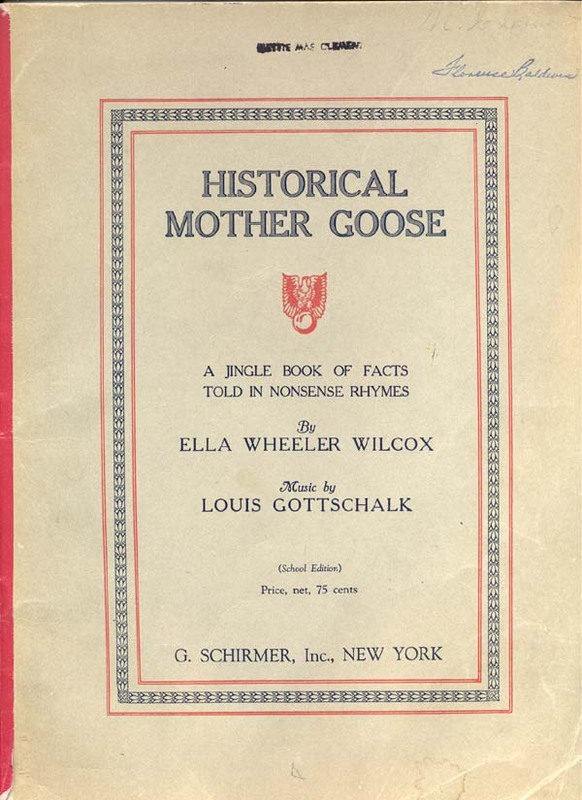 Music by Louis Gottschalk. New York: G. Schirmer; Boston: Boston Music Co., c1914. iii 38 p. illus 31 cm. Songs, with music, about persons important in U.S. history. New York: G. Schirmer, [no date]. Music by Hattie E. Bryant. Milwaukee, Wis. : H.N.Hempsted, c1876. Full text of the lyrics and Image are available. Vanderpool, Frederick W. (Frederick William), 1877-1947. OTHER: Wilcox, Ella Wheeler, 1850-1919. New York : M. Witmark, 1913. Musical Score (4 p.) ; 35 cm. NOTES: For voice and piano. Caption title. Dedicated to: Kate. Words by Ella Wheeler Wilcox and music by Minnie Louise Graham. Published by Minnie Louise Graham, c1908? London : Boosey & Co., 1901. Musical Score (5 p.) : music ; 36 cm. London : Bosworth & Co., 1896. Musical Score 7 p. 33 cm. NOTES: For a speaker with piano accomp. Caption title. MUSIC NO: B. & Co. 1176; Bosworth & Co.
NOTES: Georgy Rock, vocals and guitar; Mr. Dill, fairy pad, synthesizer, oboe, and flute; Andy Ploof, mandolin; Blake Travis, conga; Tom Ostermueller, kazoo; Clancy Blakemore, vocals; Voices of Love, vocal group. Recorded at Smith-Lee Productions, St. Louis, Mo., by Steve Higdon, engineer. Wade in the water / traditional -- Unseen beauty / James Dillet Freeman, G. Rock -- If I had wings / Yarrow & Yardley -- Everything's possible / Fred Small -- The prince of everything / G. Rock -- The goal / Ella Wheeler Wilcox -- Sara / Cleary, Rock -- Quiet calm at ease / Rev. Clancy Blakemore -- Master singer / Givens, Lafond, Russell -- Try love / G. Rock. 31 ms. parts ; 31 cm. Note(s): Arranged for band, without text./ Caption title./ Each part signed: V. Ragone./ Attributed to Mrs. George Batten, whose name does not appear on parts./ The Sousa Archives for Band Research holds an additional arrangement of this title, scored for orchestra./ Reproduction: Microfilm./ Urbana, Ill. :/ University Library, University of Illinois at Urbana-Champaign,/ 1998./ Item 6 of 12 on 1 microfilm reel ; 35 mm./ Sousa Preservation Project, Sousa Archives for Band Research, University of Illinois at Urbana-Champaign./ Funding: Microfilming funded in part by the National Endowment for the Humanities. 1 ms. score (12 p. of music) ; 36 ms. parts ; 36 cm. + 31 cm. Orchestral music, Arranged -- Scores and parts. 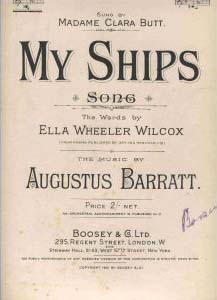 Note(s): Arranged for orchestra, without text./ Accompanied by: The Queen's last ride / words by Ella Wheeler Wilcox ; music by Mrs George Batten. [London] : Boosey, c1902. 1 vocal score (5 p.) ; 36 cm./ Vocal score inscribed by Mabel Veronica Salten./ The Sousa Archives for Band Research holds an additional arrangement of this title, scored for band./ Reproduction: Microfilm./ Urbana, Ill. :/ University Library, University of Illinois at Urbana-Champaign,/ 1998./ Item 7 of 12 on 1 microfilm reel ; 35 mm./ Sousa Preservation Project, Sousa Archives for Band Research, University of Illinois at Urbana-Champaign./ Funding: Microfilming funded in part by the National Endowment for the Humanities. [S.F., Cal.] : Harry Randall, 1900. Musical Score (4 p.) : col. ill. ; 34 cm. NOTES: For medium voice with piano. Caption title; cover has col. ill. of woman holding hour glass and photo by Schloss N.Y. of Annie St. Tel. 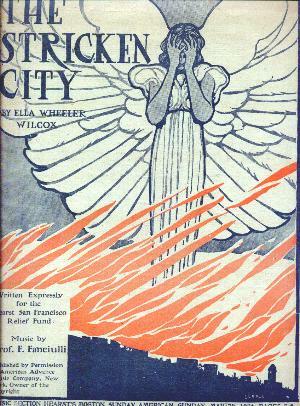 "Musical supplement to The Sunday Examiner"--Cover. First line of text: Come cuddle your head on my shoulder dear, your head like the golden rod. 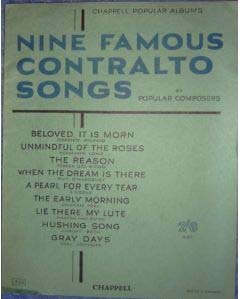 In Nine Famous Contralto Songs by popular composers. Contains: beloved, it is morn (emily hickey/florence aylward), unmindful of the roses (christina rossetti/hermann lohr), the reason (ella wheeler wilcox/teresa del reigo), when the dream is there (edith rutter-leatham/guy d'hardelot), a pearl for every tear (gunby hadath/s. liddle), the early morning (hilaire belloc/graham peel), lie there, my lute (charles h. taylor/hamish maccunn), hushing song (fiona macleod/hubert bath), gray days (archibald sullivan/noel johnson). 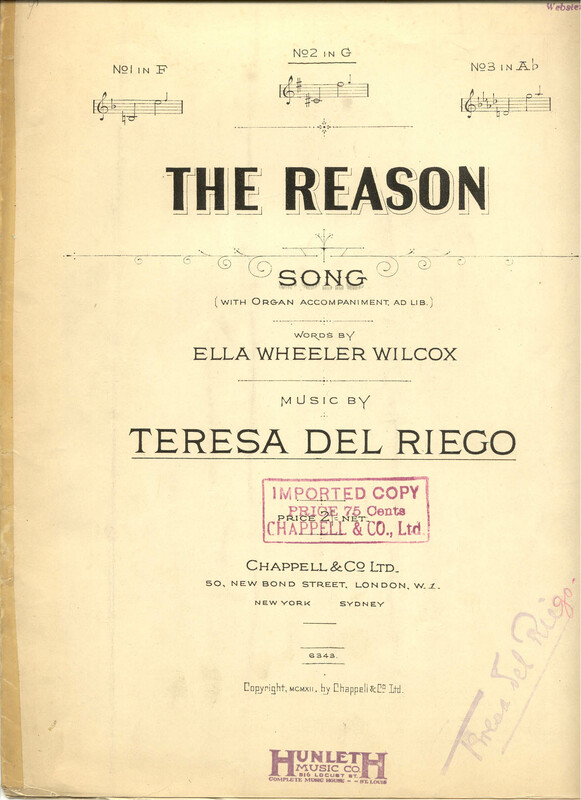 The reason : song (with Organ Accompaniment ad lib). No. 1 in F, No. 2 in G, No. 3 in Ab. London ; New York : Chappell, 1912. Musical Score (5 p.) ; 34 cm. MUSIC NO: 25301; Chappell 6343. New York: Boosey & Co., 1905. Words by Ella Wheeler Wilcox. Music by Kathleen Heron-Maxwell. New York: Boosey & Co., 1906.
 leaves ; 36 cm. or smaller. NOTES: Includes typescripts and manuscripts in pencil and ink. Some items in poor condition ; photocopies provided for public use. All in a coach and four / words by Ella Wheeler Wilcox -- Messenger boys song [2 versions] -- Doctors song -- Ben my Chree -- Jews song -- Irishmans song -- Bright is the day. Songs of the new day. For mixed voices or solo use. Boston : Luthera E. Sibley, 1922. Musical Score (8 p.) 27 cm. NOTES: Cover title. 1. One breath of song by Oliver Wendell Holmes.--2. Each in his own tongue by William Herbert Carruth.--3. Thoughts by Ella Wheeler Wilcox.--4. The house within by Dr. William F. Kelley.--5. Opportunity by Walter Malone.--6. Fear thou not by Fenwicke L. Holmes.--7. The goal, anon. A complete collection of newspaper verse during the recent war with Spain. Witherbee, Sidney A., comp. and ed. ; Bangs, John Kendrick,; 1862-1922. ; Cawein, Madison Julius,; 1865-1914. ; Crane, Stephen,; 1871-1900. ; Dreiser, Theodore,; 1871-1945. ; Guiney, Louise Imogen,; 1861-1920. ; Harte, Bret,; 1836-1902. ; Riley, James Whitcomb,; 1849-1916. ; Venable, William Henry,; 1836-1920. ; Wilcox, Ella Wheeler,; 1850-1919. Detroit, Sidney A. Witherbee, 1898. 2 p. [i-iv] p., 1. -984 p., 3. p., 24.2 cm. Note(s): 1st ed. BAL 4082./ Contributors include John Kendrick Bangs, Madison Cawein, Stephen Crane, Theodore Dreiser, Louise Imogen Guiney, Bret Harte, James Whitcomb Riley, W. H. Venable and Ella Wheeler Wilcox./ Bound in blue cloth; stamped in gold. Written expressly for the Hearst San Francisco relief fund. Boston Sunday American, May 20, 1906.Music Section, p. 5-8. NOTES: From the Music section of the San Francisco Examiner, Sunday, May 27, 1906. The test of the heart : for mixed voices. Berger, Jean, 1909- ; Wilcox, Ella Wheeler,; 1850-1919. Boulder, Colo. :; John Sheppard Music Press, 1967. 1 score (14 p.) ; 26 cm. Music by Jean Berger ; [words, Ella Wheeler Wilcox]. Three sacred solos for medium voice. New York ; Nashville : Abingdon, 1963. Musical Score (8 p.) ; 31 cm. NOTES: We pray / words by Helen Lowrie Marshall -- Once in royal David's city / words by Cecil Alexander -- Gethsemane / words by Ella Wheeler Wilcox. Three songs for voice and piano. New York : G. Schirmer, 1940. Musical Score : 1 score (3 v.) ; 30 cm. NOTES: For medium or low voice. Pl. no. : 38257, 38256, 38975. 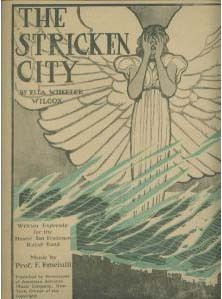 April / Theodosia Garrison -- The winds of fate / Ella Wheeler Wilcox -- The ship of Rio / Walter de la Mare. Boston, New York, Chicago: White Smith Music Pub. Co., [no date]. Cincinnati : John Church Company, 1910. Musical Score : 5 p. 33 cm. SUBJECT: Wilcox, Ella Wheeler, -- 1850-1919 -- Musical settings. Songs (Medium voice) with piano. Music by Wm. F. Sherwin. 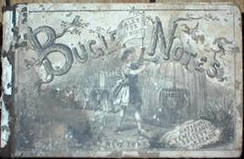 In Bugle Notes for The Temperance Army:A collection of Songs,Quartettes,and Glees. Adapted to the use of all Temperance Gatherings ,Glee Clubs,etc. Together with the Odes of the Orders of the Sons of Temperance and Good Templars. Edited by W.F. Sherwin and J.N. Stearns. New York : National Temperance Society and Publication House, J.N.Stearns,Publishing Agent,No.58 Reade Street., 1871. Music by W. F. Sherwin. When the Regiment Came Back. Full text of the lyrics and audio clip are available. Ella Wheeler Wilcox [words] & Dan Barker [music, singing]. On CD#2 of Friendly Neighborhood Atheist [Audio CD] published by Dan Barker. 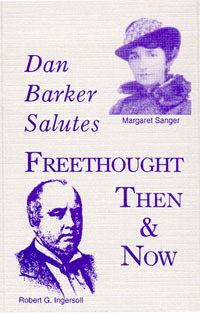 On Dan Barker Salutes: Freethought Then And Now. [Cassette] published by Dan Barker.